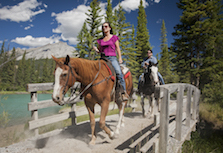 For many Banff visitors, riding horseback through the mountains is a dream come true. For us, ensuring their dreams are achieved while providing a safe and authentic western experience is the real dream! Horseback outfitting was one of the first tourist attractions in Banff National park and there were many outfitters in the early days. We are still guiding guests to remote mountain lakes, valleys and passes but also offering shorter rides, western cookouts, carriage rides and day excursions. We are a very active tourist business with several components that make up the overall company. Because of the diversity of the company, we can offer a great variety of products to our visitors, as well as a variety of job opportunities to people like you. Riding is one of the best ways to see Banff National Park. Living and working in Banff is a unique experience and a fun one. There are many things to experience and do on your days off. It’s always sad when the season comes to an end! Whether you are craving a summer of adventure, are looking to improve your horsemanship skills or a combination of both while making life long friends and memories, Banff Trail Riders is the place for you! Below are brief descriptions of each position as well as requirements. Wrangler/Guide: Caring for, feeding, grooming and handling horses. Guiding trail rides from 1 hour to 6 days in length and performing general barn duties and chores. Previous riding experience and horsemanship required. Backcountry Packer: Packing supplies on mule to and from backcountry locations. Is person responsible for all maintenance required at camp. Must be physically fit, able to ride/handle younger horses and work independently. Riding experience required. Candidates for role of Packer are selected from our wrangler/guide pool based on performance, work ethic and assessment of fit for position. Carriage/Wagon Drivers: Providing narrated carriage tours through the Town of Banff and wagon tours along the Bow River to our remote cookout site. Driving experience preferred, but willing to train the right candidate. Driver’s licence required. Backcountry Cook: Living in camp, preparing and serving meals for up to 20 guests. Is responsible for all cleaning. Backcountry cooks commute to and from locations on horseback. Riding experience preferred, but not required. Steak Cook/Host: Preparing and serving meals for our lunch and evening Cookouts. Ordering, receiving and keeping inventory. Driver’s license required. Guest Reception Staff: Check in and book trail rides, help guests on and off or their horses. Answer any questions Banff visitors may have about our services. Customer service experience required. Previous experience with computer reservation systems an asset. Retail/Reservations Associate: Join the team at Banff’s downtown western hub. Assist visitors from around the world with western wear from head to toe, gifts, carriage ride and trail ride reservations. Retail and customer service experience required. Previous experience with computer reservation systems an asset. There are seasonal and year-round positions available. Maintenance/Shuttle Driver: Dynamic and creative problem solver keen to take on a variety of jobs. Is responsible for upkeep and maintenance on all company vehicles, equipment and on-site buildings. Drive guests to and from various town and company locations. Experience with large vehicles and trailers preferred but not required. Class 4 Licence required. Shared housing is available off-site, more details can be discussed during the application process. To apply, please apply online or email your application to alyson@horseback.com. If applying for a Wrangler/Guide; you will be required to attach a photo(s) of yourself riding. Based on the nature of the position and the specific skills required, we need these photos to help access abilities. If applying for driving position; a photo of yourself driving/riding may be requested. Due to the high volume of applications we receive, only candidates who meet requirements and have submitted a complete application, will be contacted.